The Phillips OneBlade 2520 kit is both for trim and shave. It is capable to trim edge and shave almost all kinds of hair. This electric machine comes with rechargeable battery. The battery will provide 45min operating times per 8 hours of charge. This machine can adopt 100volt – 240 volt AC. So it is for universal use. The blade is not like a traditional blade for that your skin will stay comfortable. Full 2 years warranty and 45 days money back guarantee. 3 trimming combs (1mm, 3mm, 5mm). Phillips OneBlade 2520 electric machine is engineered with a revolutionary design. This electric machine is designed for facial styling and body grooming. It is able to trim, shave and edge almost all kinds of hair. The fast-moving cutter can move 200X per second. This one blade does not cut like a traditional blade. So your skin will stay comfortable and move the machine against the grain then shave off easily all length of hairs. There are 3 stubble combs come with this package. To get the even stubble length, just attach one of the click on stubble combs. The 5mm comb is for long stubble. 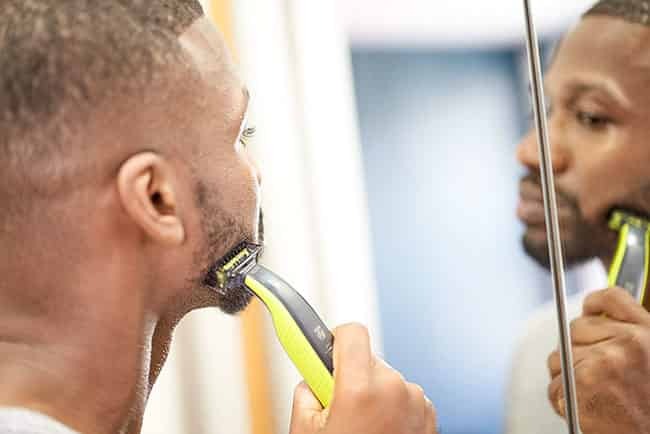 The Phillips OneBlade electric trimmer and shaver can easily follow every contour of your face and you will get a comfortable trim/shave to all areas of your face. This one blade is durable and provides you a long-lasting performance. But for an optimal result, you have to replace the blade after 4months of use. The Philips OneBlade can easily follow every contour of your face and use the dual-sided blade to style your edges and create a clean line. You can move the blade in any direction. The Phillips OneBlade trimmer and shaver 2520 is for wet and dry use. So you can use it dry or you can use shaving gel, foam, and soap for a wet refreshing shave. This electric machine is water resistant for that cleaning is so easy. Just hold it under running water for the easy rinse. Phillips North America Corporation warrants their every new product for a period of 2 years from the purchase day. They will repair or replace your product if there is any workmanship problem (without blade and comb) with free charge. This warranty does not cover if your product damages for abuse or misuse, accident or lack of reasonable care. After buying the Philips OneBlade, if you are not fully satisfied with this product, you can return it within 45 days. The Phillips Norelco will back your full money. But when you will return it, you must have to return it along with the dated sales receipt. The product must be postmarked within 45 days. All the instructions you will find in the warranty card and user guide. 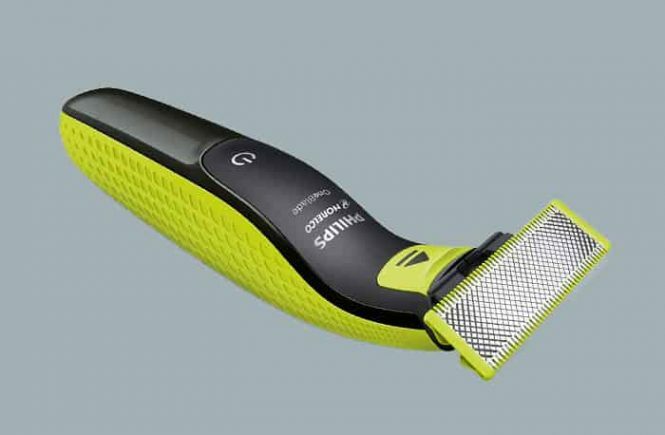 The Phillips Norelco Oneblade 2520 electric trimmer and shaver is the combination of 2 colors – lime green and charcoal grey. The machine’s handle is made with a ribbed rubber grip. So there is no chance of suddenly fallen down. There is an ON/OFF button on the front side of the handle. The charging socket is situated at the bottom of the machine. There are 3 stubble combs for even stubble trim – 3/16 inch/5mm, 1/8 inch/3mm, and 3/64 inch/1mm. The blade is not so sturdy, it feels fragile. The machine dimensions – 7.1 x 8.1 x 2.4 inches. This machine is for wet and dry use. You can use any kind of shaving cream, gels, and soap for a refreshing wet shave. Being water resistant, the cleaning of this machine is so easy. There is no risk of water causing problems. Phillips OneBlade electric trimmer and shaver QP2520 is powered by Ni-MH rechargeable battery. The battery will provide you 45 minutes operating times per 8 hours of charge. 8 hours is a really long time. But you should consider the price range. There is a battery indicator; this indicator will provide you the notification when the machine needs to plug in for the charge. When the machine becomes fully charged, the battery percentage will show 100% and the light will flash continuously. This machine is only for cordless use. The battery quality could be better because sometimes it makes misbehave, does not work properly and take more than 8 hours for a full charge. Some of my friends gave objection about the battery. Honestly, I am not happy with the battery life and its quality. I rather choose the Philips OneBlade pro for the battery quality. Important- the blade is breakable so handle it with care. Never tap the blade on the back to remove the hair from it. It can cause damage to the blade. Always turn the machine off before removing the comb from it. 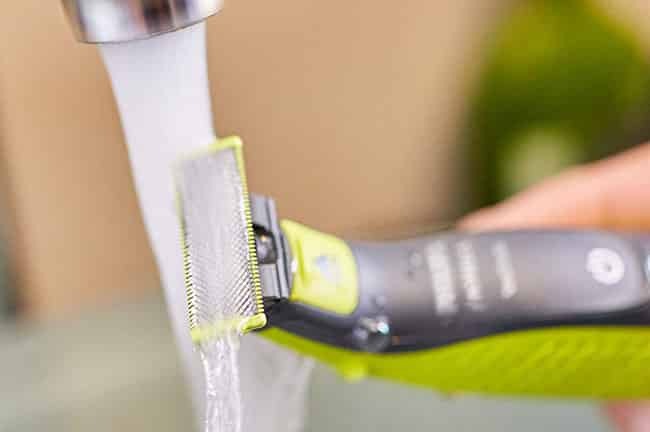 If a lot of hair deposits on the blade or comb, you have to simply blow them off first. Then turn the machine ON and rinse the blade and combs under running hot water. Hot water does not mean the boiled water, it has to be lukewarm. After the rinse, let all the parts air dry. Never use a cloth or tissue for drying the blades. This machine is 100% waterproof so there is no chance of water causing problems. The Phillips OneBlade QP2025 is not only a trimmer it is also a shaver. The blade is not like the traditional blade. It will provide you a comfortable shave. We all know how to shave. I don’t need to talk about this section it is like another general shaving machine. Always move the machine against the hair growth. I don’t have any objection about shaving. My shaving experience is good and even I don’t feel any kind of razor burn or irritations. There are 3 stubble trimming combs with this package for the different length of hairs. Tip- to get the best result, trim your beard dry and operate it against the hair growth. 1st place the comb on the blade properly. The comb teeth can upwards or downwards. If you trim for the 1st time use the 5mm trimming comb. Because it will prevent accidentally trimming hair too short. Don’t operate the machine so fast. Move it gently. Never operate the machine against its teeth. All the hair doesn’t grow in the same direction, so you have to move the machine different positions like – upwards, downwards, across. Practice makes as perfect and to get an optimal result just do practice. I don’t have any objection about this section. Only, the comb quality is not so good. But we have to remember the price range. If you use it carefully, I think it will be last longer. The manufacturer recommended that to get an optimal shave/trim, we have to replace the blade after every 4 months. After replacement of the blade, your machine will work like before. Replacement is less costly than buying a new one. 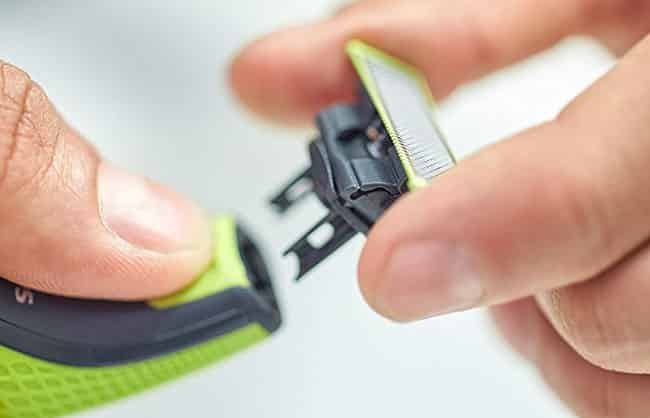 How you will know when you need to replace the blade? The blade is furnished with a blade wear indicator; a green bar will slowly rise on the blade when you use it. When it is highly visible, that time you need to replace the blade. Replacement head is available in the Amazon. About the replacement, you will get all the instruction in the user guide. Don’t use this machine with plugged in. it can cause electric shock. Do not use the power plug in the bathroom. Accidentally it can fall or pull into the tab or sink. Immediately unplug the machine after recharging. When you clean the machine, be certain it is unplugged. To minimize the risk of electric shock, burns, fire, and injury to the users. You have to be more careful when you will use this machine on children or invalids. Don’t use another attachment which comes from another machine. Never operate the machine if the power cord is damaged. Keep the machine and its attachments as well as the power plug from heated surfaces. If the blade or the combs becomes broken or damaged, don’t use it. It can be causes of facial injury. Use the power plug supplied only with this machine. Never keep the machine in direct sunlight. Can You Cut Your Body Hair? This machine is only for the facial hair and this machine is not recommended for using any parts of your body. The QP2630 is for the facial + body hair. If you want to cut your body hair you can buy the Philips OneBlade face and body shaver QP2630. 1 star = 13% (based on 3,032 customer reviews). Maximum customer who provided the negative reviews, most of the objection is about the plastic quality and the battery. Yes, I told you the plastic is not so sturdy. For that, you have to use it very carefully. Always I like to try something new, and for that, I bought the Phillips OneBlade 2520. 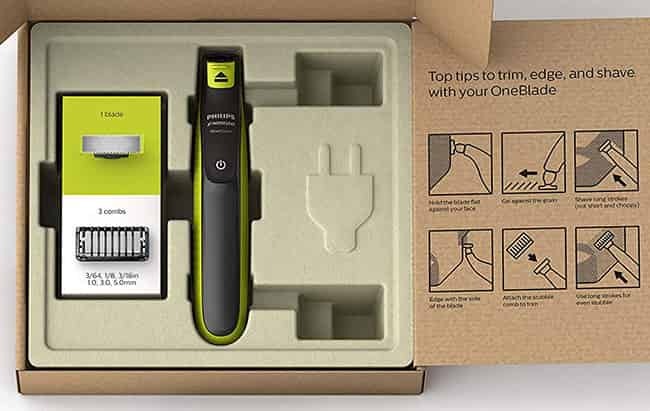 The Phillips Norelco one blade electric trimmer and shaver QP2520 provided me a satisfactory performance but it broke down after 10 months of use. The built quality is not so good. It can break down through a little pressure. But if you use it carefully I think it will be last longer. I don’t have any objection about the shaving performance. My displeasure is only about the battery and the cheap plastic. I don’t want to recommend you for this product. For a better quality, you can choose the Philips OneBlade Pro. You can buy it for a test. After the test, if you will be not fully satisfied, you can return it within 45 days. To get all the services, register your product immediately after buying. This machine is for facial + body hair. 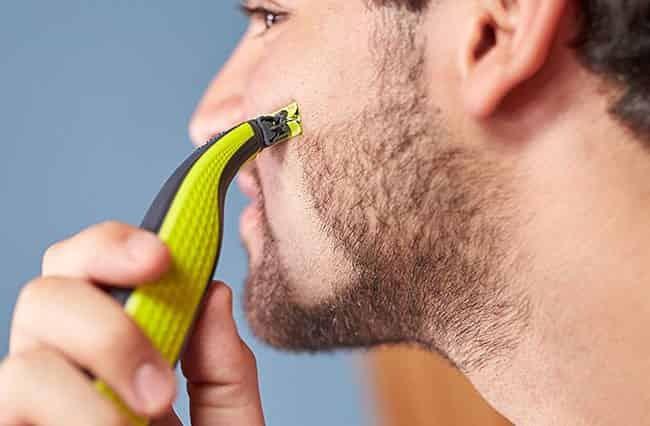 There are 2 blades – one is for the facial hair and another one is for body hair. There are 4 stubble combs for even trim + 1 comb for the body hair. Powered by lithium-ion battery which will provide 60 minutes running time per 4 hours of charge. Full 2 years of warranty and 45 days money back guarantee. The customer rating is 4.1 out of 5 stars. This machine is costly than the QP2520. This machine is capable to trim, shave and edge any length of hair. 100% waterproof. Use wet and dry. Powered by lithium-ion battery which will provide 90 minutes operating time per 1 hour of charge. It only comes with one blade and a comb. There are 14 hair length settings in the comb. Universal voltage – 100volt – 240volt.